Tools: We made this sign for you to attach to a inkjet recycling box that reminds people to recycle their inkjet cartridges. Click it to enlarge it then print it out now (You can also copy the sign and paste it to your word processor for printing.) 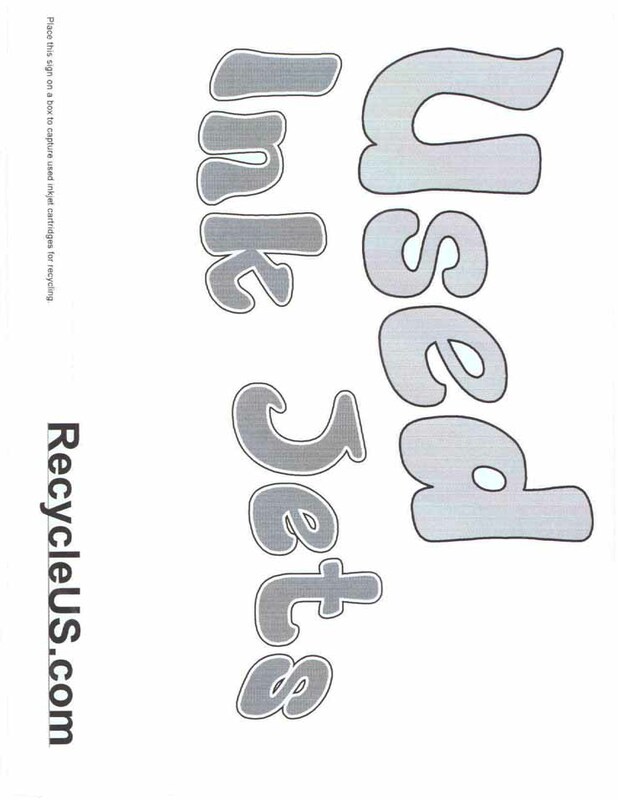 When the inkjet recycling box is full, use our mailing label & we will recycle them. Tri-Color cartridges are expensive. Most experienced users only print in color for special final documents. They always set their printers for printing in black, until that special occasion. Always try to save your color cartridges for printing the final document. Doing this will save money, as the cartridges with black ink are least expensive. Here's how you can change your printing from color to black with most printers using Win98. From the File menu select Print, then select Properties, then select print in Black in White or Grey Scale. When you want to return to print in color, just reset the settings reversing this procedure. To change the font size select View, select Text size and select the font size that will work best for you. Making this change can help in printing web pages. Why is it that we always run out of ink, when we need it to print just one last page. Also, occasionally you will get a defective cartridge, even brand new cartridges from the OEM. How do I know which cartridge I need for my printer? Before you contact us about your printer or a cartridge, it will save you & us a lot of time if you specify the exact inkjet cartridge you need. There are many printer manufacturers, thousands of printer types & new ones are introduced almost every day. Most of them use many of the same cartridges. We recycle 87% of all of them. The best place to find what you need is in your printer operations manual, or you can look at your cartridges. Chances are good, you can answer your own question when you know the cartridge number. My cartridge is not empty yet and I would like a spare. Can you send me one? Sure we can. It's wise to keep a spare on hand. It always seems that you run out of ink just when you need your printer the most. email us: cs @ recycleus.com and you'll have your order in 3 to 5 days. Under "Payment Methods" you have only listed Credit Cards. Will you accept personal, business or company checks? Yes, we do accept company and business checks through our parent company Ribbon Recyclers. Inc. (as long as they dont bounce). There is a $10.00 processing fee to order from Ribbon Recyclers, Inc. To order from Ribbon Recyclers Email us! or call 800-477-3465 (if you get our voice mail when you call, make sure you leave your number and a good time for us to return your call). Why don't you charge Sales Tax? We do collect & report sales taxes in Colorado. We do not collect sales taxes in any other state. If you have a tax exempt status in Colorado, we will process the order through our parent company Ribbon Recyclers. Inc. Email us! or call 800-477-3465 (If you get our voice mail when you call, make sure you leave your number and a good time to return your call). You will normally get faster service when you Email us. Is there a minimum number of cartridges (or maximum) that can I can order? NO. We will recycle one or millions of cartridges for you. There is NO minimum nor maximum. However, if you need several thousand, you should email us. Our ship time may change. Will your recycled inkjets hurt my printer or void the warranty? No, we are refilling your cartridge, which was manufactured by the same company that made your printer. We refill thousands of cartridges every month and have never had a customer have a problem with the operations of their printer. Your warranty cannot be voided, USA anti-trust laws prohibit it. What about the ink quality? How does it compare to OEM Ink supplied with new cartridges? People have had bad experiences with cheap ink used by some recyclers. The refill kits (using syringes) and some methods do have problems and have made people cautious about recycling. RecycleUS.com DOES NOT use a universal ink for any cartridges. We use a specific ink for each specific cartridge type. Many factors are considered in the ingredients of each ink, including viscosity, pigments and many other details. We guarantee your cartridge will print just like a new one from the manufacturer. Your order form refers to the HP 51629A/G. I have the 51629A. Is there a difference? We list the HP 51629A/G. HP sells the 51629A cartridge and the 51629G. The cartridges are exactly the same except, for marketing purposes HP has put only � the ink in the 51629G cartridge. They charge a few dollars less for the 51629G than the 51629A. We refill both of these cartridges and they both are filled with the same amount of ink as the 51629A. This type of suffix differences on cartridge numbers is also true with other HP cartridges. For instance the C6615D / DN / A. HP has put only 25ml in the C6615D and 42ml in the C6615A. MSRP is only a little less with the C6615D. We refill both of these cartridges and they both are filled with the same amount of ink as the C6615A (42ml). You can send in either and the price to us is the same. See the chart above. Why dont you refill some of Tri-color cartridges? 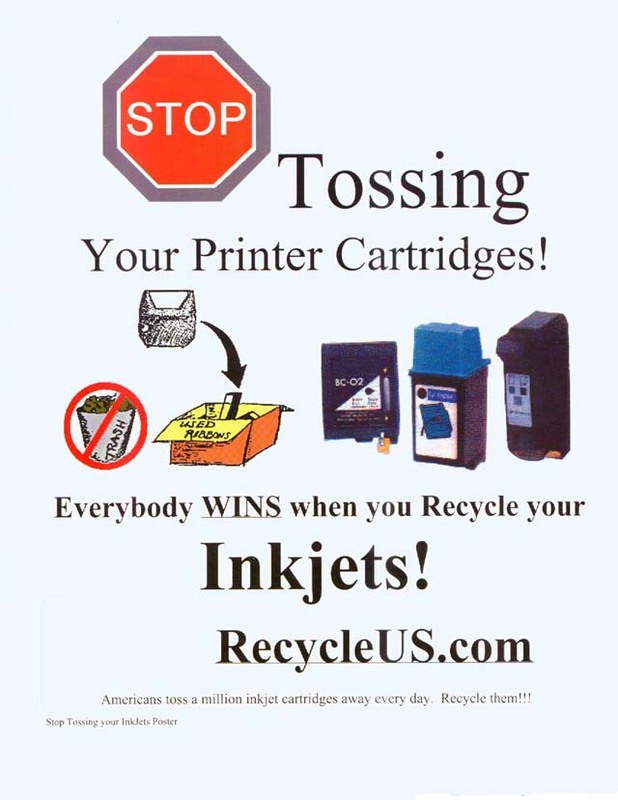 We do not offer Tri-Color refill service for some inkjets because the cost to recycle them is not economical. We would have to charge more than retail price for some of those tri-color inkjets. We do recycle some Tri-Color & single color cartridges with the same success rate as the black cartridges. Normally you will receive your recycled cartridge order in 3-5 days. If you don't have your order in 7 days, Email us. Please type RUSS-nnnnn - Status as the first words on the subject line of your email. Place your original Order number for the nnnnn . We will respond PRONTO! My cartridge is not on your price list. Can you recycle it for me? Probably, just email us: cs @ recycleus . com and we will reply PRONTO. We are always working in R & D to offer more cartridges. We are evaluating and are in development stages of several new cartridges including the HP C4844A and the C4841A. We are very pleased with the initial results. We can't promise though when they will be ready for production. The best we can say is for you to save your empties & periodically check our web site for updates or contact our parent company Ribbon Recyclers. I live in Minnesota, & I was wondering if the ink in the cartridge could freeze or leak in the mail when you send it back to me. We always send the cartridges in a padded envelope and ALWAYS take them directly inside to the USPS Office (We are in Colorado - so it can get cold here too). We guarantee your cartridge will operate like new when you get it, so don't worry about it freezing. If you do experience a problem with the cartridge, just follow the steps on this link: What if my laser cartridge has a problem? What do I do with my empty cartridges? Inkjets: Included with each cartridge you order is a postage paid self addressed (green printing) white plastic envelope. Simply keep the envelope and when you are ready, place your empty in it and place it in any USPS mail box. It is important not to send anything else in these envelopes. Only those cartridges that can be recycled will have the envelope. As a rule, most HP & Lexmark inkjets can be recycled. Only few Canon, Brother, Compaq & Epson cartridges can be recycled. If your cartridges do not have the envelope, they can't be recycled. So there is no need to send them to us. Do you buy empty cartridges? Sure we do. Lots of organizations sell them to us & use us as a fund raiser. But we only buy selected empties cartridges in quantities of 100 and more. The cartridges must never have been recycled before and must be in good condition. As a rule, most HP & Lexmark inkjets can be recycled. Only few Canon, Brother, Compaq & Epson cartridges can be recycled. Empty cartridges are commodities and so the prices paid for them is volatile. Other factors also effect the value of empties, i.e. the number of defective cartridges & quality of the empties. The amount we pay depends on the cartridge type, it's condition when we check it out and the market value at the time. Once you have over 100 cartridges, email us and we will email, fax or send you a "RecycleUS.com Buy 100+ Empty Cartridge Form". Once you complete this form, it becomes a purchase order. As soon as we get the cartridges we will evaluate them and send you a check for the ones that qualify. Do you recycle laser printer cartridges, like the HP LaserJet office printers? Yes. Just email us: cs @ recycleus . com and we will reply PRONTO. If your laser is not listed, email us the mfg and cartridge model number. We possibly can recycle it. In some cases we may need your empty cartridge in advance. The laser recycling is through Ribbon Recyclers, Inc. (Our parent company Ribbon Recyclers does offer laser printer recycling. The best way to contact us is to Email us Email us your name, phone number, cartridge refill order number. Someone will call you back with the details. Another option is for you to call 800-477-3465, leaving your name, phone number, cartridge refill order number and repeat your phone number. I used to send in my empty cartridges for refill. Why don't you offer this service any more? We have made some changes for several reasons. First, we have grown and the administration of receiving the empties, refilling them and returning them became too cumbersome and costly. Next, we depended upon the USPS & their service proved to be unacceptable. (We had orders that were mailed from less than 20 miles from our plant and it took as much as 6 weeks for us to receive the order. Both our customers and we wanted dependable, faster service & we could not provide that with the refill service. What is the relationship of RecycleUS.com and Ribbon Recyclers, Inc? Ribbon Recyclers, Inc. is a Corporation in Colorado. RecycleUS.com is a registered DBA (doing business as) of Ribbon Recyclers, Inc. The following inkjet cartridge replacement and troubleshooting tips are taken from various Printer Operations Manuals and apply to brand new cartridges and RecycleUS.com's quality remanufactured cartridges. We hope you find them helpful. Your printer operations manual is the best source for answering your questions. This information is applicable to most Hewlett Packard, Canon and Lexmark inkjet cartridges. If you are not sure if this information is applicable to your printer email us before attempting them. It is suggested you print at least one page a week to keep your cartridge fresh. 2. If applicable, carefully remove the plastic clip from the replacement cartridge. 3. If applicable, carefully remove two pieces of protective tape covering the ink nozzle and maze hole. NOTE: Two pieces of tape are not always used, if you only see one don't worry. CAUTION: DO NOT TOUCH THE INK NOZZLE OR COPPER CONTACTS. 4. Carefully install replacement cartridge into the printers cradle. NOTE: For detailed instructions refer to your printer manual or printer software. 1. Perform up to three cleaning cycles and a prime cycle, if applicable, using your printer software. If the cleaning cycles fail to produce quality print it may be necessary to prime the cartridge. 1. Hold the cartridge (nozzle down) and place on a paper towel moistened with warm water & then on a dry paper towel until the ink begins to siphon. 2. Remove debris and dried ink from the replacement cartridge nozzle plate with a damp cotton swab. DO NOT wipe the nozzle plate. Use distilled or filtered water only. 3. Re-install the cartridge and perform cleaning cycles as instructed. If your questions are not answered here, dont hesitate to submit any question or special request via email, Contact us.